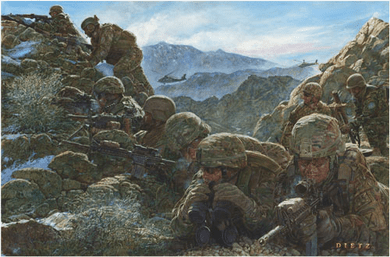 James Dietz Hand-signed and Numbered Limited Edition Print:"Climb to Glory"
About the Art: During Operation Enduring Freedom XIII, beginning in January and ending in October of 2013, Combined Task Force Wolverine was tasked with serving as the primary advisor to the Afghan National Army within Western Paktika Province, maintaining security through partnership and offensive actions against an aggressive enemy, and facilitating the eventual closure/ transfer to their Afghan Partners of two Forward Operating Bases and one Combat Outpost. The Squadron Combined Task Force took control of an area of operations the size of the state of Rhode Island, comprised of river valleys, rocky peaks, vast desert plains and urban areas with a total population of over 350,000 Afghans. They also assumed responsibility as the primary advisors for two of the most active Afghan National Army units operating in Afghanistan at the time.